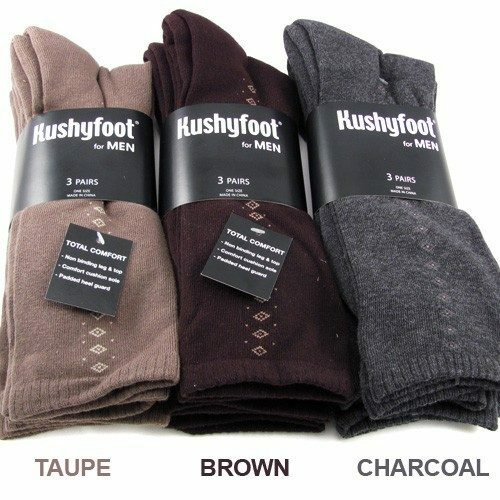 Kushyfoot Mens Padded & Comfortable Dress Socks 3 Pack Only $5.99 Plus FREE Shipping! You are here: Home / Great Deals / Kushyfoot Mens Padded & Comfortable Dress Socks 3 Pack Only $5.99 Plus FREE Shipping! Whether it’s your husband, dad, brother or son, you know how men cling to old socks! These Kushyfoot Mens Padded & Comfortable Dress Socks 3 Pack Only $5.99 Plus FREE Shipping offer style and comfort. Pack includes a pindot and two solids in the assortment. Their crew length is ideal with all your casual shoes and outfits!